A question that we get asked by people new to Progenesis LC-MS is “why is the final list of proteins in my experiment exactly the same in every group?” The simple answer, and part of the power of Progenesis LC-MS, is co-detection. Co-detection is what we call our approach to peak picking based on an aggregate of all the runs in your experiment. It results in the same peptide ion outline applied to the same feature on every run. This means you do not need to rely on the MS instrument successfully fragmenting the same feature or generate a positive identification for it in every run to produce a final list of biologically interesting proteins. In the example below, the montage is displaying the same section of three replicate LC-MS runs from a control sample compared to treated sample. The peptide ion abundance is lower, if not absent, in control compared to the treated group. However, you still detect and obtain a measurement, even if it is close to zero abundance, for the same feature in the same location. This means both control and treated runs contain the same set of quantified and identified peptides. Therefore each group contain a common list of quantified and identified proteins, which can be directly compared to determine the significance of any protein expression differences. Montage of sections from ion intensity maps with m/z on the x-axis, retention time on the y-axis and ion intensity in the z-axis is represented by grey-scale intensity. NB: what you can’t see at this scale is that individual isotope abundances within the profile are detected and combined to give an ion abundance measure for the peptide in the precursor spectra. The power of co-detection comes from aligning the MS data first, so you can quantify and compare the same peptide ion in every run. However, we do not need it to fragment in each and every group to confidently identify what the ion is. In the example above, the treated runs gave the most intense ion abundance measures and generated fragmentation spectra that correctly identified the peptide in the first and third replicates. 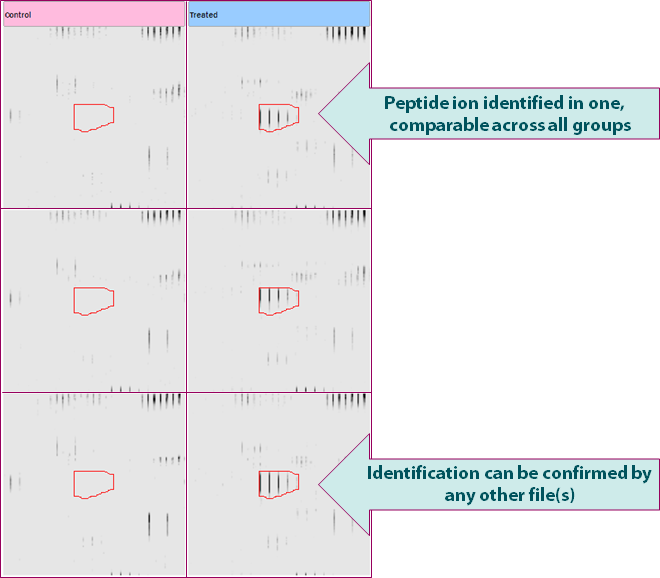 Quantified peptide ions are automatically combined with identifications imported from your database searches. 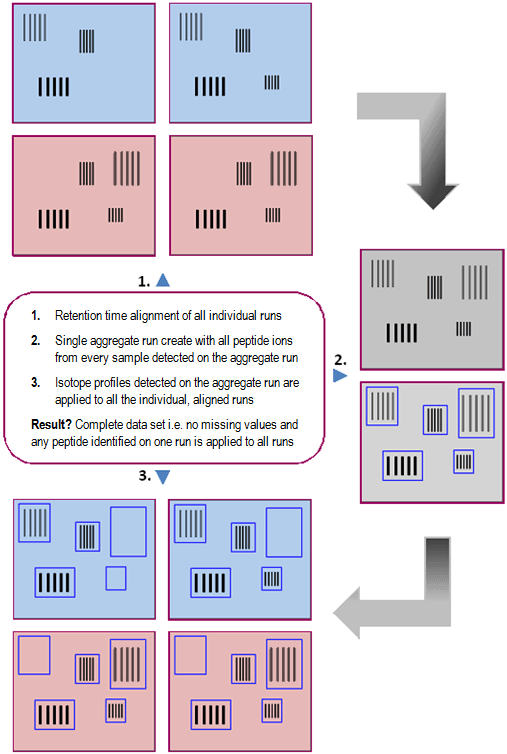 This means any single peptide identification can be confidently assigned to the same peptide detected across all runs. Obviously the more common “hits” you get across the whole experiment the higher your confidence in the assigned peptide identification. No missing values in your data, i.e. there is a measurement for every feature you are trying to compare between groups. So you can apply multivariate statistics to generate reliable results. Why not download Progenesis LC-MS and try it on your own data today? This entry was written by Paddy Lavery, posted on July 4, 2011 at 9:13 am, filed under July 2011 and tagged Progenesis CoMet, Progenesis LC-MS. Bookmark the permalink. Follow any comments here with the RSS feed for this post. Post a comment or leave a trackback: Trackback URL. When the abundance become ‘0’ with fold change ‘infinity’, how the Progenesi calculate the ANOVA-p-value? If no missing value is created by this program, why the abundance become ‘0’ but not the value nearly ‘0’? Where Progenesis reports “0” as the abundance for a sample, then the observed value of 0 is used for the ANOVA calculation, just as any other observed value would be. Progenesis only reports “0” as the abundance where there is truly no signal in the peak outline for that ion. Low abundances are still reported.